Tracing ancestors in Ireland has never been easier. The first sources to consult are the family elders. wills and title deeds, etc. The latest state-of-the-art tool for identifying long-lost cousins and shared ancestors is DNA comparison, now available for as little as USD49. The family folklore is re-told in many Irish families at Christmas time. This talk will help you to ask the right questions and take the right notes whenever your extended family gets together. Soon you will be well on your way to recording the histories of all 16 of your greatgreatgrandparents and beyond in your favourite genealogy software. Genealogy is about names, dates and places. These are the bones; family history is the flesh on those bones. the place(s) or website(s) where a manual, photographic or digital copy (or copies) of the record can be seen. In rural areas of Ireland, we can typically identify the townland in which the event happened. In urban areas, we can typically identify the street address at which the event happened. Ireland has been partitioned many times for many non-genealogical purposes, but the genealogist needs to become familiar with some of these repartitionings. Depending on the record, there may be an all-Ireland index, a 26-county index, county-by-county indexes, or indexes for subdivisions of counties or areas crossing county boundaries. Unless a person's name is extremely rare, narrow down the search by place before you begin. Once we know the townland, we generally need maps and/or lookup tables to figure out where to look for the record; for a summary, see this table. In your genealogy software, document the source of every name, date and place that you find, whether it be a family source, a local source or a national source. The most basic source is Google, which is great for more unusual names or combinations of names, but Google, by accident or design, does not harvest many genealogy sites. The National Archives of Ireland 1901 and 1911 Census of Ireland website and search form can be used to look for your parents, grandparents, greatgrandparents, greatgreatgrandparents, or more distant ancestors and relatives. The census is just the first in a series of stepping stones through the past. There are many other websites where you can start your research before you visit libraries and archives. Home page is rather out-of-date. Marriage records 1870-1941 (Catholic marriages for 1864-1869 and non-Catholic marriages for 1 Apr 1845-1869 to be added). Data protection arguments relating to data on living persons are used to explain why more recent birth and marriage records are available offline only. Death records 1878-1966 (1864-1877 to be added). Data protection arguments relating to data on living persons are also used to explain why more recent records related to deceased persons are available offline only. Births over 100 years ago, marriages over 75 years ago and deaths over 50 years ago due to be added in annual increments. The one-size-fits-all search form can mislead beginners. 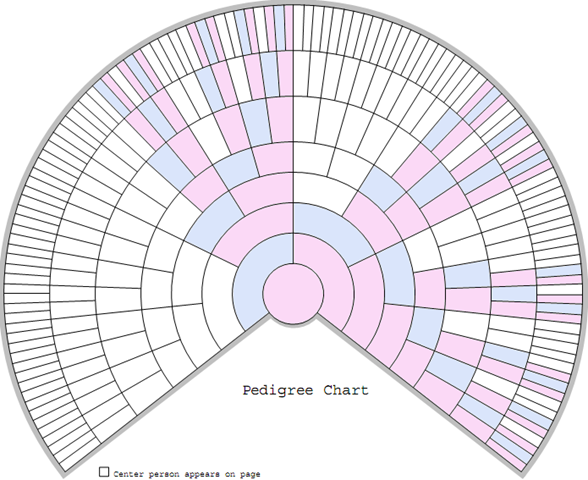 The birth index includes mother's maiden name only from Abt 1900-1916. Sometimes the groom is Party 1 and the bride is Party 2, sometimes the numbering is reversed. Search separately for Kelly, O'Kelly, O Kelly and OKelly to cover all angles. Similarly for Mc Namara and McNamara. 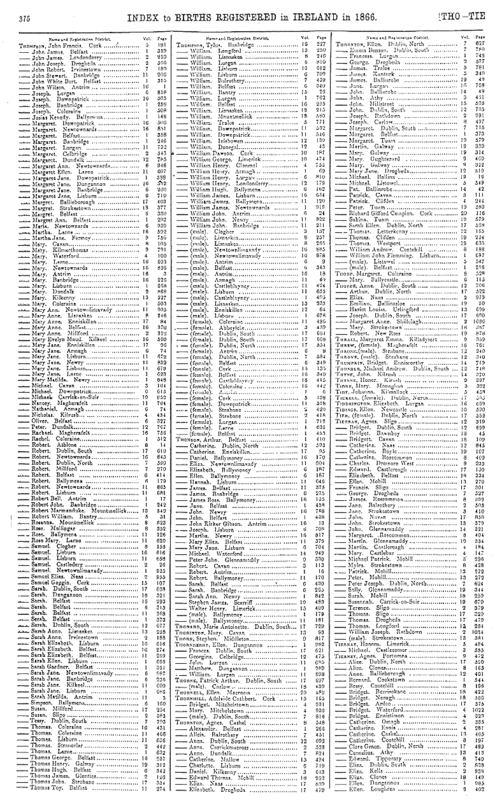 Church records for only about four counties, mostly pre-1900. The results from the main search form provide links to other free government-backed online databases. Catholic parish registers up to Abt 1880. Killaloe Catholic parish "Contains the old cathedral parish of Killaloe with the addition of the old parish of O'Briensbridge save the detached western portion of it (Truagh) now in Clonlara parish. The Baptismal Register commences 24 May 1828. The Marriage Register commences 26 February 1829. No gaps are noted." John Grenham confirms that all Killaloe records up to 1880 were microfilmed and are online and that the commercial Clare Heritage and Genealogical Centre has indexed the originals up to 1900 (not available to researchers). The National Library of Ireland microfilms are transcribed (badly!) on other commercial websites. ... in Killaloe civil parish in the barony of Tulla Lower in the county of Clare in the province of Munster. Not to be confused with Shantraud in Adare civil parish in the barony of Kenry in the county of Limerick. In the 1911 census, the more rural part of Shantraud was enumerated separately from the streets in Killaloe DED. We are in the Poor Law Union of Scariff (sometimes spelt Scarriff) (both pre- and post-Famine). Part of the pre-Famine Scariff PLU became part of the post-Famine Tulla PLU from 1852. From 18 Apr 1899, the county boundary was moved to bring part of Scariff PLU from Galway into Clare. Tulla and Scariff PLUs were amalgamated again in 1907. Includes more recent births and marriages than the official website. the post-Famine Poor Law Unions for all births, marriages and deaths from 1 Jan 1864. The indexes don't include spouse or parents, apart from the birth index from c1928-1958, which includes mother's maiden surname only. To narrow the search, you can fill in one of (a) birth date and/or place (b) marriage date and/or place or (c) death date and/or place. Filling in fields which are blank in the record you want will prevent you from finding it. Searchable by parents' names, unlike the official website. To narrow the search, you can fill in both parents' first and/or last names and/or birth date and/or place. The appropriate placename to use varies from year to year and from record to record. Try townland or dispensary district or Poor Law Union or county. These years are not yet on the official website. To narrow the search, you can fill in spouse's and/or father's first and/or last names and/or marriage date and/or place. Irish marriage certificates did not until relatively recently include the name of either the groom's mother or the bride's mother. To narrow the search, you can fill in death date and/or death place and/or residence place. Irish death certificates did not include the name of any relative until c2004, unless the informant happened to be a relative, and even then the relationship may not have been specified. The appropriate placename to use is generally the townland. In some non-Irish records the familysearch.org transcriptions may include father's first name, mother's first name and mother's last name, but not father's last name! See, for example, many entries in New Jersey, Marriages, 1678-1985. You must leave the father's last name blank if you want to find these records. Beware that Tipperary, Tipperary North Riding and Tipperary South Riding all appear on the drop down menu! It is apparently not possible to hyperlink to specific map locations - see discussion. It is possible to link to the occupiers of a specific location using the PlaceID, e.g. Ballina (PlaceID=1223328). Results are stupidly broken into pages of 20 occupiers at a time. To view Original Page or Map View, right click on icon and select "Open Link in New Tab". Try lining up the OSi maps, Griffith maps and Google Street View - details here. Valuation Office - for revisions of Griffith's Valuation. autosome is short for autosomal chromosome. The Y chromosome comes down the patrilineal line - from father, father's father, father's father's father, etc. X DNA may come through any ancestral line that does not contain two consecutive males. 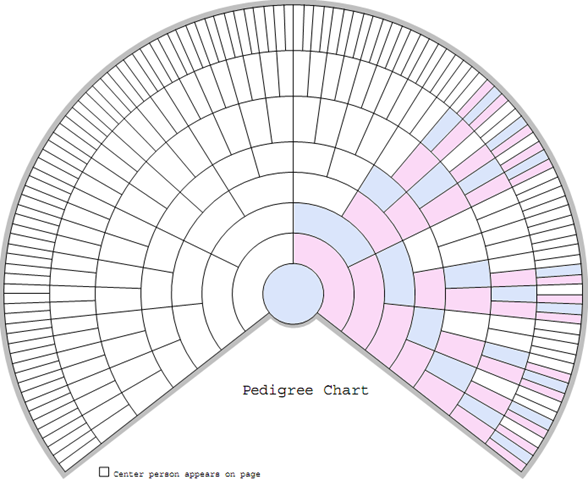 Blaine Bettinger's nice colour-coded blank fan-style pedigree charts show the ancestors from whom men and women can potentially inherit X-DNA. Exactly 50% of autosomal DNA comes from the father and exactly 50% comes from the mother. Similarly, siblings each inherit 50% of their mother's X DNA, but not the same 50% (except for identical twins). Sisters each inherit 100% of their father's X DNA. small proportions of the very many more distant relatives in the database.